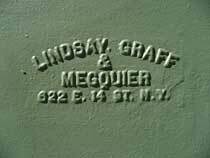 Lindsay, Graff / & / Megquier / 622 E. 14 St. N. Y.
Lindsay, Graff and Megquier were William A. Lindsay, Jacob Graff (1832-?) and Arthur Selwyn Megquier (1840-?). Of the three, Jacob Graff seems to have been in business in New York earliest. He was listed as a "machinist" in Trow's New York City Directory of 1859. He is also recorded in the U. S. Census of 1870 living in Brooklyn, age 38, born France. William A. Lindsay appears in Brooklyn city directories starting around 1875. He lived for many years at 161 Bergen St. 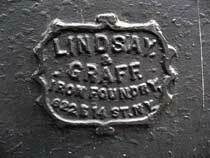 He and Jacob Graff had formed a partnership, Lindsay & Graff "iron railings" at 6 Sullivan St. by 1878. In 1880 this company had offices at 42 Duane St. and a foundry on East 14th St. In 1881 the office had moved to 129 West Broadway, and the foundry's address on 14th St. was 622 E. 14th St. 622 East 14th St. is the address that appears on all of their foundry marks. 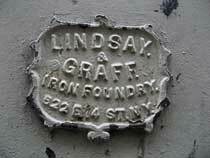 The first listing in New York city directories for Lindsay, Graff & Megquier "architectural iron works" is in 1882. But Arthur S. Megquier (born 19 April 1840 in Winthrop, Kennebec County, Maine) was already living in Brooklyn by the time of the 1880 U. S. Census. And the company was included in the 1880 U. S. Census non-population schedules for manufacturers. They were recorded there as owning $25,000 of real capital and $80,000 of raw materials. They employed as many as 75 men (and an average of 70) at total annual wages of $31,875. Manufactured products and services in the year preceding 31 May 1880 were valued at $190,000. 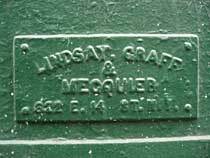 The last listing in city directories for Lindsay, Graff & Megquier is 1885. By 1885 Arthur S. Megquier had returned to Maine, and he appears in the Portland, Maine, city directory for that year, as a brass founder in partnership with Henry M. Jones in that city. 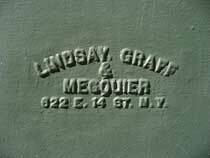 In 1886 Lindsay, Graff & Megquier reverted to the firm name of Lindsay & Graff. 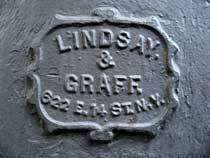 In 1888 Trow's Copartnership Directory recorded Lindsay & Graff as dissolved. At this point the two partners seem to have gone their separate ways. In Lain's Brooklyn Directory for 1890 William A. Lindsay, still living at 161 Bergen St., was in business as "iron" at 61 Warren St., Manhattan, and Jacob Graff "iron" was located at 302 Union Ave., Brooklyn. William Lindsay's business on Warren St. continued to be listed through 1898. Jacob Graff is found in the U. S. Census in 1900 (age 67, occupation "Landlord") and in 1910 (age 77, occupation "Iron Merchant Retired"). 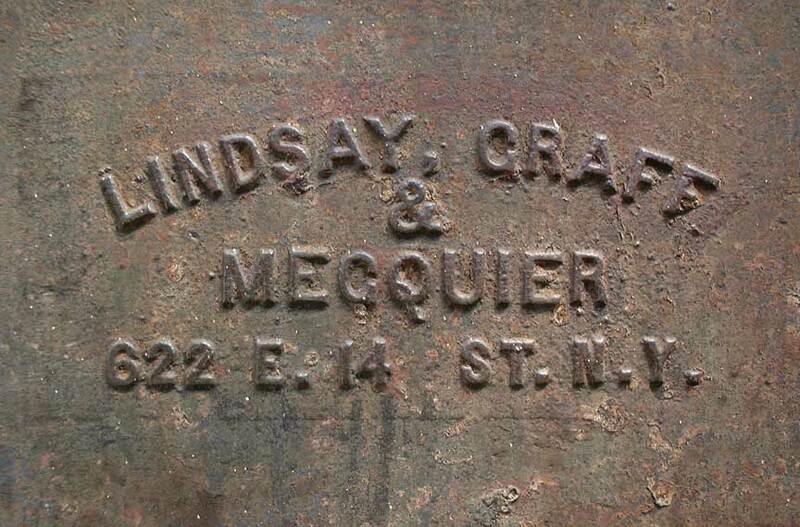 The productive years, then, for Lindsay, Graff & Megquier seem to fall between 1880 and 1885. For Lindsay & Graff the same would fall between 1885 and 1888. Given the proliferation of cast-iron facades in New York with these foundry marks, these time frames seem rather short. My own search for these marks in only the most obvious locations has todate uncovered 15 cast-iron facades and 1 instance of vault lights. For those buildings where I was able to find a new building notice on the New York City Dept. of Buildings website, the dates ranged from 1882 to 1887. Margot Gayle, writing in Cast-Iron Architecture in New York: a Photographic Survey (1974), says of 83-87 Grand St., "Architect William H. Hume did it in 1883 as a silk showroom and warehouse - an addition to that section of the building ... which had been erected 10 years earlier. Perhaps it was part of an original grand plan, for the architect had the iron elements for this big addition cast in exactly the same design as for the first building, resulting in a unified whole. The older part of the building carries the date 1872 in its galvanized iron cornice, and displays the foundry label of Lindsay, Graff & Megquier." (Click for image of cornice.) 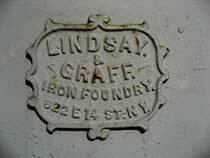 Note: It is unlikely that Lindsay, Graff or Megquier were involved in casting the iron for the older, 1872, building. The foundry mark probably relates only to the newer, 1883, section. Norval White & Elliott Willensky, AIA Guide to New York City (4th ed., 2002), write, "Nos. 83-87 Grand St., SW cor. Greene St. 1872. William Hume. Serene Tuscan over elaborate Corinithian." The same source on "Nos. 37-43 Greene St. 1884. Richard Berger. Green composite columns over a Corinthian base." Margot Gayle, in Cast-Iron Architecture in New York: a Photographic Survey (1974), writing about 654 Broadway, where the foundry mark is covered with a heavy crust of paint, mentions 83 Spring St.: "A few blocks away at 83 Spring St. an almost identical facade appears." 654 was designed by the architect, J. Morgan Slade. Gayle wonders "if Mr. Slade did that one [83 Spring St.] too, or if it was ordered out of a catalogue."